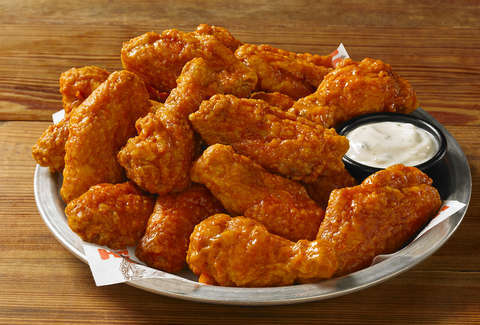 If you think the classiest dinner money can buy is a night of buffalo wing at Hooters, get ready for a shock. You can do better. You can rip up a photo of your ex-partner at a Hooters on Valentine's Day all in the service of scoring free adult chicken nuggets. It's true. Head to the famously skimpy restaurant on February 14, and you can partake in its annual "Shred Your Ex" event. Buy 10 wings, rip up a photo of your ex, and you're going to land 10 boneless wings for free. As Jimmy Durante would say, "Hot cha cha." If having to step over the waggling tongues of drooling pubescent teens isn't your idea of a good time on a lonely Valentine's Day, you can shred exes online. After you tear your former partner to pieces, you'll get a digital coupon and can order some wings to take back to your empty apartment. Though if you do it at a restaurant, the pictures go into a shredder, which will truly impress the teens at the table next to yours. Teens love shredders! If you too enjoy a good shredding, you can bring in a big ol' stack of exes. Though, you're only going to get 10 wings. You don't get 10 for every time your heart has been broken.